A responsive stompbox that will put a flavour of that cranked Marshall raunch on your board. Easy battery access. Natural sound. Useful tone controls. The two voices are not as distinct from each other as we'd like them. 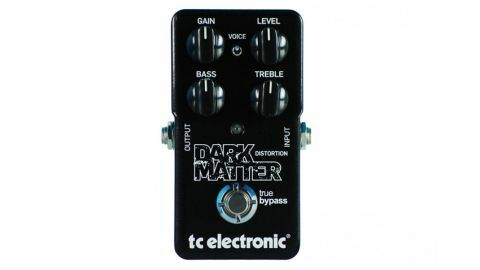 Where the equally new TC Electronic MojoMojo pedal takes its inspiration from the USA, the Dark Matter (reviewed here) aims closer to home, for early Plexi flavour. "The sound responds to pick pressure and cleans up nicely when you roll off the volume"
This is classy Brit overdrive/distortion sounding fairly natural and valve-like, with a range running from an amp just starting to break up through to a full throaty roar. The dynamics don't become squashed though, and the sound responds to pick pressure and cleans up nicely when you roll off the volume. The voice switch tweaks the midrange response, with emphasis on the lower or higher mids - there is a difference but it's subtle.